These two quotes summed up how I was feeling about my horse racing bets. What seemed like a great edge and was making great money to start with (so much that I got banned from nearly every bookmaker), gradually started to disappear. All the great value horses I used to spot were still around but with not quite as much value as there once was. Rather than adapting to maintain the edge, I was standing still. As the saying goes, if you’re standing still you’re going backwards. Before I know it, good profits were turning into mediocre profits and mediocre profits also added the occasional losing month. It got to the point that the time and the effort to analyse the races was not producing the profits to make it worth while. That was when I decided to take a much needed break from betting. All my bets were posted on Twitter beforehand so there is full transparency. This is not me claiming magical winners out of this air. Saying that I will caveat a couple of points. All the results were posted based on the price at the time of posting. While as some people will rightly point out that there will be a lot of rule 4 winners in there, on the flip side, I don’t inflate the profits when the SP is higher than the posted price. The latter being a favourite trick of many a tipster. So overall, 26 months of postings resulted in an overall profit of 714 points and 36% ROI. Sounds pretty good right. 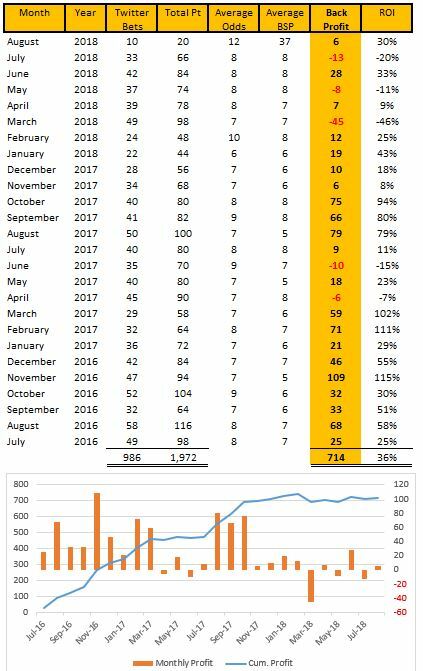 When I tell you the first 16 months equates 693 of these points and a 52% ROI, you can probably see where the problems start. The last 10 months only returned 21 points and a 3% ROI. Once I accounted for rule 4s it was an overall negative for me (some may have done better if anyone can still get BOG). I decided that 10 months is enough of a period to decide the edge is no longer what it is. The only problem or concern is I still don’t know if it is a temporary blip or it has fully disappeared. It is only an edge why the rest of the population has not cottoned onto it. I did not share my edge, and any person who does is an idiot, as the more people that know about an edge it suddenly becomes not an edge as prices adjust accordingly. My only guess is that with more and more information out there, the betting population and more importantly the bookies got wise to my edge and prices adjusted accordingly. The only piece of advice I can give is, once you find an edge, milk it for as much as you can as quickly as you can as that edge can soon disappear. After spending large periods of time gambling for the past 5 years, taking 5 months off has been great in some ways but strange in others. I’ve suddenly found I have a lot more spare time in the evenings. While that is good some ways, more time to spend with the wife and friends, on the other hand there does feel something missing. Due to that I’m going to gradually creep back into the sports analysis world but focussing on some areas that I enjoy to try and bring the fun back – my thinking is analysing football but focussing on the lower leagues. I feel there is so much information and people analysing the EPL, there just isn’t the value in the odds. I have a few angles that appear promising and have backtested well, but I’ll only start posting once I have proof in the pudding that it actually works going forward. I’ll carry on enjoying my break, but when I say break I mean break from gambling. I still work full time unfortunately but hopefully I’ll come back refreshed with a new edge that can be milked for some healthy profits. All the results are belatedly on the blog and on twitter so feel free to let me know if you have any questions.